SAN DIEGO — Forget Macy’s Thanksgiving Day Parade. 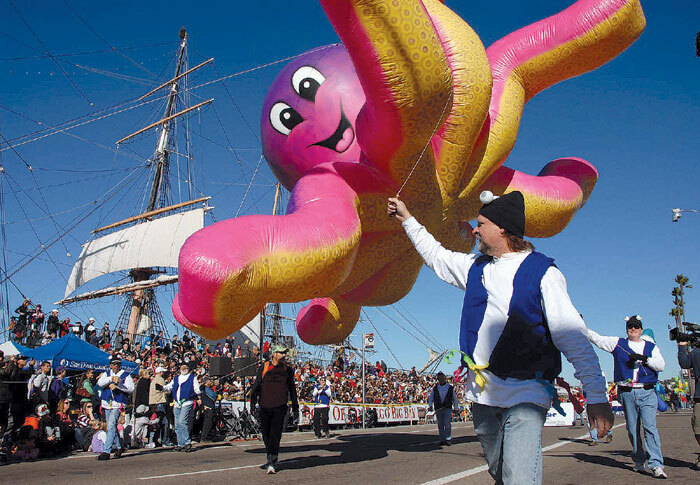 Southern California boaters can celebrate the holiday season by watching America’s largest procession of giant balloons — the Port of San Diego’s annual Big Bay Balloon Parade. It begins at 10 a.m. Dec. 27 on North Harbor Drive, near the Maritime Museum of San Diego. The spectacular — viewable from the water at the beginning of the parade route, and on shore along Pacific Highway during the conclusion — will include enormous colorful balloons, marching bands, decorated floats, drill teams and hundreds of participants. The parade will start near the County Administration Building on Harbor Drive and will run south, turning left on Ash Street and right on Pacific Highway, then continuing south all the way to Broadway. The parade will be televised locally and nationally. Event organizers recommend that shoreside spectators obtain a seat in the grandstand near the Maritime Museum of San Diego for the best views. Grandstand tickets are $15 through Dec. 13; $20 starting Dec. 14. There is a $2 processing fee for each purchase. The parade is being held in conjunction with the Big Bay Family Festival, with games activities and entertainment for all ages at the Broadway Pier, from 9 a.m.-1 p.m. Other scheduled festivities include the 16th annual Wienerschnitzel Wiener Nationals Finals at 9:30 a.m., the Bumble Bee 5K Run/Walk (starting in front of Holiday Inn by the Bay) and a Battle of the Bands at 11:45 a.m.
All streets surrounding the parade area will close to traffic at 7:30 a.m. The balloon parade is presented by the San Diego County Credit Union and is a Bridgepoint Education Holiday Bowl Production. For tickets and more information, visit holidaybowl.com.